Increase your CME exposure by featuring your courses on RadLIST. Featured CME providers on the RadLIST homepage have their name highlighted in blue bold font which includes a link to their homepage. The RadLIST file cabinet icon allows visitors to search your CME meetings, online/self study courses, and live webinars. For a CME provider to be featured on the homepage list, 75% or 12 of their courses, whichever is less, must be included in the featured CME rotation with a photo. Quick and easy instructions for adding a CME course to the featured rotation are found in your CME Sam account. Each featured course costs $95 which includes unlimited course impressions and clicks. 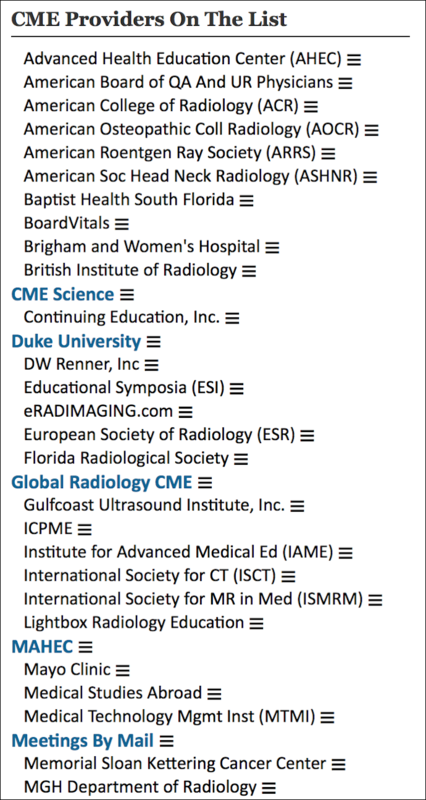 CME provider accounts on RadLIST are free and each provider that has an active course is included in the homepage CME provider list free of charge. The RadLIST file cabinet icon allows visitors to search CME meetings, online/self study courses, and live webinars. Please note, all CME courses on RadLIST are posted and administered through our parent website, CME Sam. To learn more about requesting a CME provider account, please click here.